The Hunt is a film directed by Thomas Vinterberg, co-written with Tobias Lindholm. 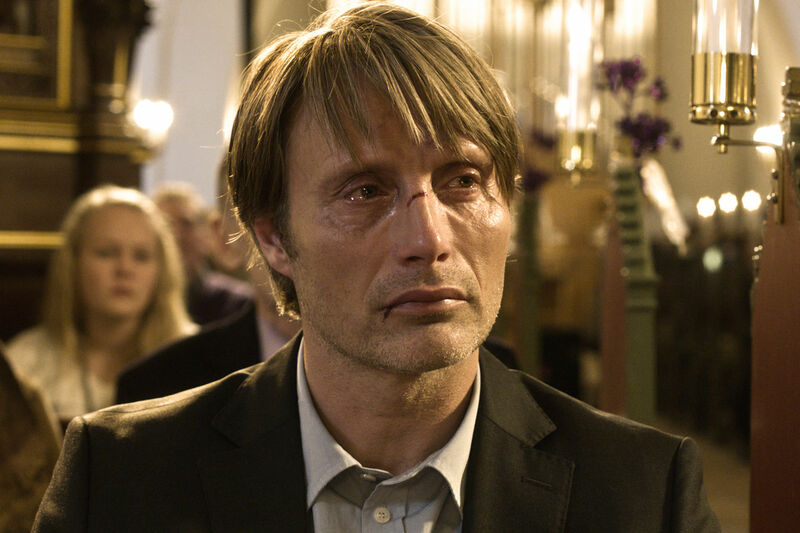 It premiered in competition at the 2012 Cannes Film Festival where it received several awards including Best Actor (Mads Mikkelsen), the Prize of the Ecumenical Jury, and the Vulcain Prize for Cinematography (Charlotte Bruus Christensen). 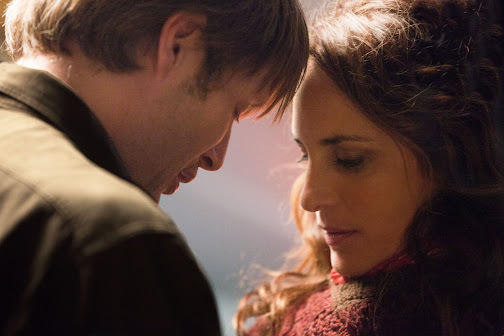 It also won the People's Choice Award at the 2012 Vancouver International Film Festival. A stunning return to form for Vinterberg, who by most accounts has floundered in the last decade, unable to repeat the success of his excellent 1998 film Festen. This one tells the harrowing tale of Lucas (Mikkelsen, who has had a fantastic year), a recently divorced man working in a small town kindergarten who is falsely accused of exposing himself to one of the students. 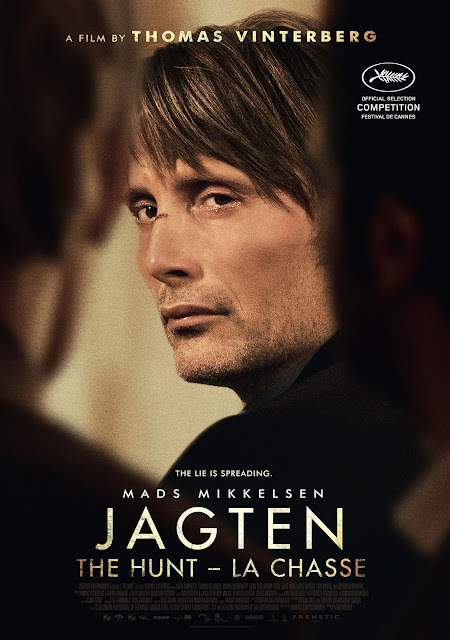 The premise is one that could easily be written off as yet another movie-of-the-week drama, but Vinterberg avoids going down that route, with clear and unambiguous direction; a wonderful screenplay that creates an intense and unsettling psychological portrait; elegant production values; and an outstanding lead performance from Mads Mikkelsen. The narrative takes time to develop, following Lucas' character closely, to paint a full portrait of the man. He's well liked by everyone in the small town, and his life seems to be going well with a new job and new girlfriend. Wisely, Vinterberg doesn't try to make a mystery out of it, from the beginning there's never any question as to Lucas' innocence, and so the focus is entirely on how quickly a little lie can spread, and how devastating the impact can be. It can at times be very frustrating to watch these events unfold, especially with some of the actions of the citizens of the town. 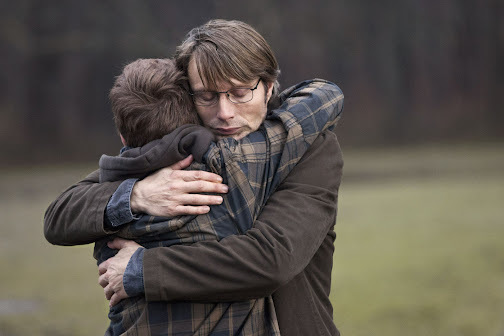 But even as the situation grows quickly out of control, Vinterberg's direction remains steady, keeping all the performances believable and impressively building a torrent of emotions that threaten to go over the top but never do. He also takes full advantage of close ups of Mikkesen's emotive face, and in it we see the full results of a man caught in a terrible storm of hysteria. It's also a strong technical effort that's pleasing to the eye and ear. 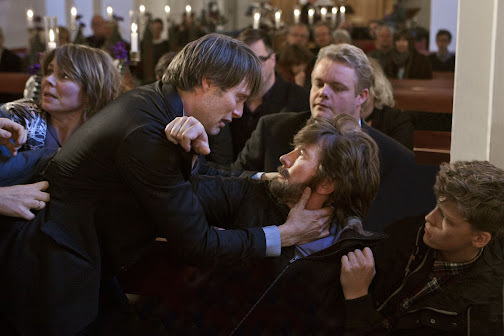 The widescreen cinematography by Charlotte Bruus Christensen is remarkably crisp, nothing like the low-budget and erratic Dogme 95 style of Vinterberg's earlier works; and the original score composed by Nikolaj Egelund is restrained, used only to complement, never to overpower the images. The scenario might not be so original, but this is a perfectly executed picture where all of the parts come together in compelling fashion. It's another powerful slice of drama from Denmark, and one of the best films of the year. Mikkesen is a good actor, I only first saw him as a bond villian, the story does sound good! Great review! Highly likely this will be in my top 10 of the year. Thought it was absolutely brilliant and has made me even more interested in checking out Festen! Great review BT - I do want to see this. My first thought - like instant reaction to this trailer when I saw it a while back was Millers The Crucible. Besides the basic plot line, did you get that feel about it? I haven't seen the film, but do intend to. It could just be the title - I immediately thought of "witch hunt" which then took me to The Crucible, but I would think Vinterberg is too smart to do something like that casually. Did you see it as a contemporary re-imagining of the Crucible? If so, its possible this film is carrying some sort of critique on the genre itself.... food for thought. I can't wait to see it. Again - great review as usual. It sounds interesting.. I think I mostly wanna watch it to see how it ends. 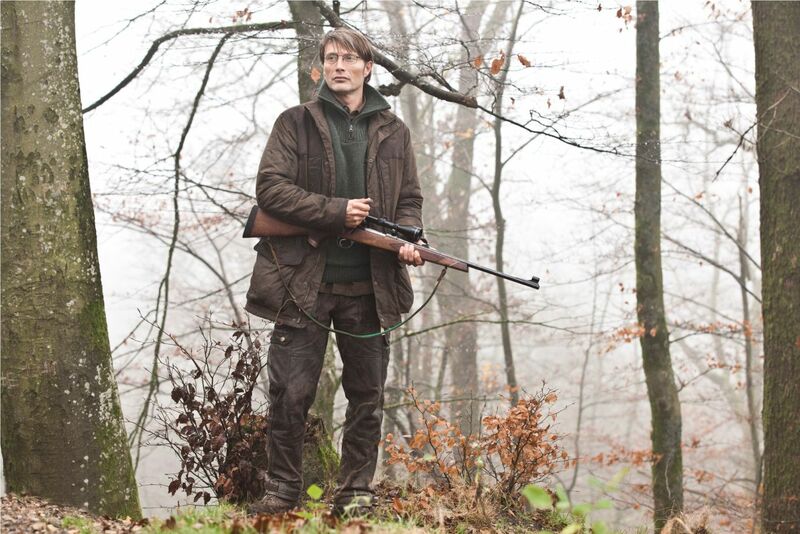 I figured I would see it anyway because of Vinterberg but it's good to know why it gets your seal of approval. He does have that villainous look to him. Thanks Pete. You should definitely give Festen a watch. Thanks Lisa. You are correct. I didn't draw that comparison, but it does have that feel. 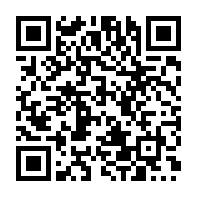 Just modernized and on a smaller scale. Did you buy your tickets already? Oh well. I thought it was pretty trim and didn't really feel there were any redundant parts in it... except for maybe a little bit at the end. That is very true, and it does happen in real life quite regularly. I was just reading in the news about a case in my town where a teacher has just been acquitted in court. Thanks for the visit and comment, Sam. It started it's week of screenings in Perth on Monday and we went first night. Very good film, impressively restrained throughout was my first reaction, especially because of the hysterical nature of the content. 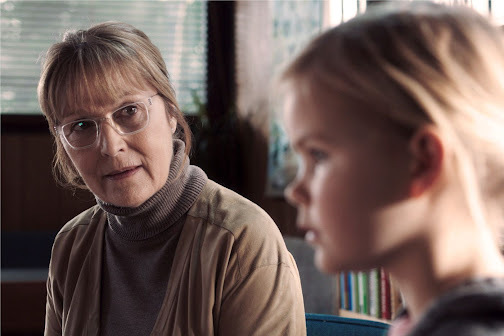 You said watching it was frustrating and boy was that an understatement, although I did enjoy the fact that Vinterberg happily painted the gossiping, scared, old ladies as the villains of the piece. The tacked on ending was a complete letdown for me, not least because it seemed to distract the audience from the main body of the work and led to "who was that with the gun?" conversations but yeah I'm not a fan of ONE YEAR LATERs in the best situations.